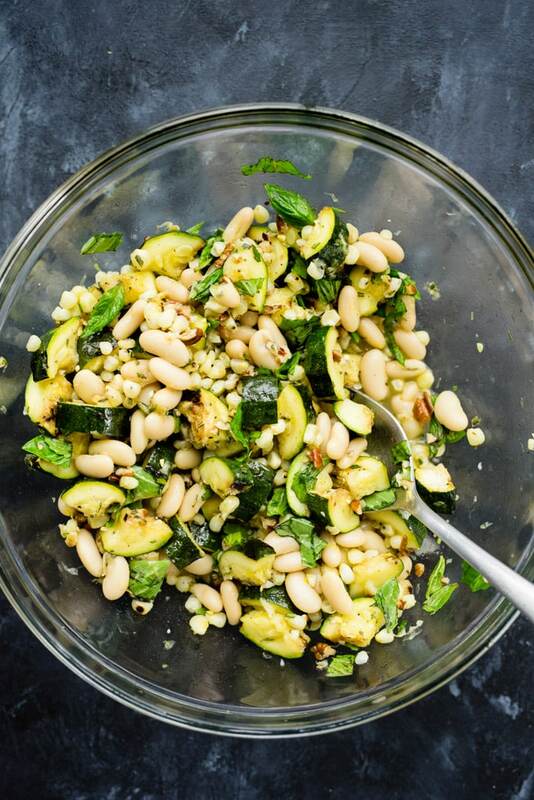 A little sweet, a little smokey, a little crunchy – this grilled zucchini salad with corn and marinated white beans has all the tasty flavors of summer. It’s substantial enough for lunch or dinner on its own, but also makes a great side dish for picnics, potlucks and parties. 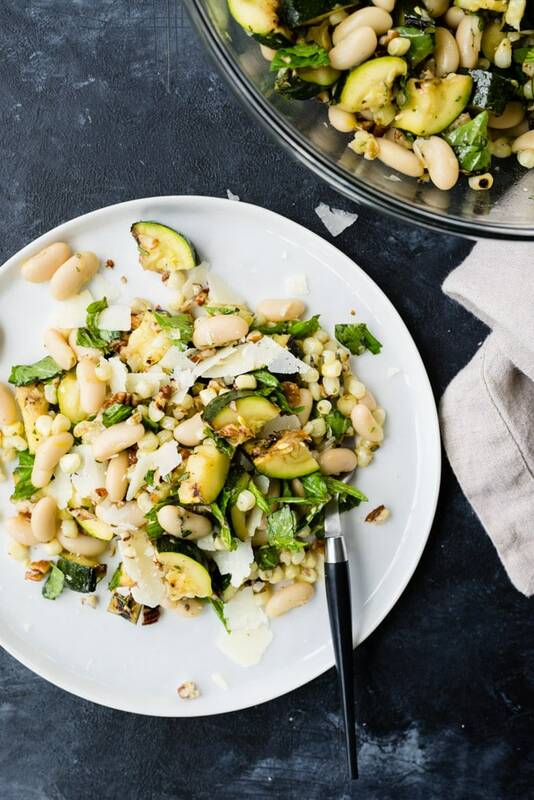 Delicious cold, warm, or room temperature, this vegetarian and gluten free zucchini salad is a flexible summer recipe that’s as easy to eat as it is to make! I’ve been in a bit of a food rut the last few weeks, eating the same thing over and over. Part of it is the weather. I’m not so lame that I’m resorting to talking about the weather on the regular, but if you’ll indulge me for a moment – I am so freaking sick of rain. We’ve had SO MUCH RAIN this summer, and it’s been a major buzzkill. But last week the clouds parted and the humidity was low enough that I didn’t feel like I was drinking the air, so I went on a mission. A rut breaking mission. And as my 8-year old would say, the results were epic. I danced in my kitchen eating this straight outta the bowl, and you will too. A little grilled veggie action. A little marinated white bean action. Some handfuls of this and that. And half an hour later I had this grilled zucchini salad. It’s not exactly beautiful – it’s kind of a hot mess if you ask me – but hot damn if it isn’t delicious. If you’re a little skeptical of this combo, that’s okay. Cameron was skeptical too. Trust is essential in this relationship, so please jump off this flavor cliff with me. 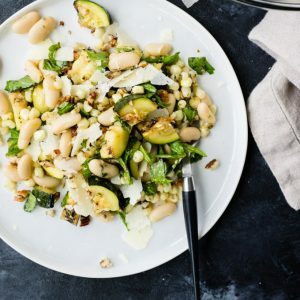 The smokey veggies with the creamy white beans combine with the tart dressing and bright basil for a spoonful of explosive flavor in every bite. Honestly corner? As much as eating a paleo diet makes me feel pretty great, there are a few culinary delights that consistently hold me back from going at it 100%. Cheese is one because, well…cheese is delicious. But also white beans. They are like a siren call from the pantry, and I cave to their magic every few weeks. No regrets. Onto the salad! We’re gonna get the white beans started because marinated white beans are jam packed with all of the flavor. No bland white beans for you my friends. Hells to the nope. 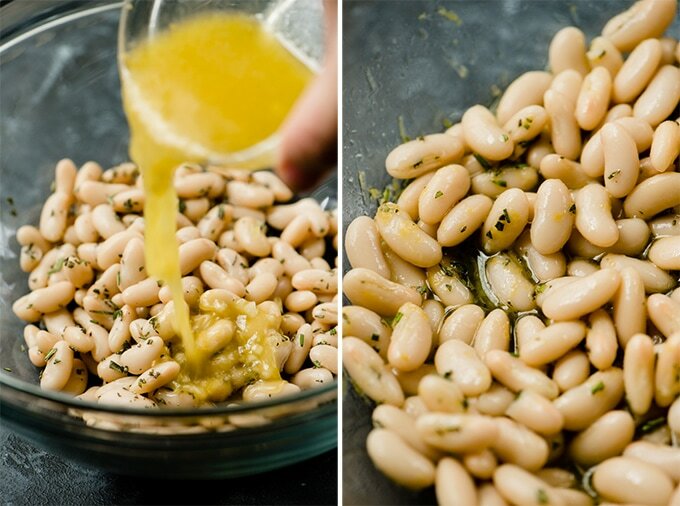 White beans + rosemary + lemony dressing situation. Get ’em all into a bowl, then toss. Set aside to marinate while you grill up some veggies. There will be lots of dressing in the bottom of the bowl and that’s 100% super fine. We’ll use that later. Fire up your grill for medium to medium-high heat. Preferably a charcoal grill because it imparts that OMG smokey flavor, but a regular grill works too. Husk your corn, then slice the zucchini in half. I like to grill the zucchini in halves as opposed to chunks so that it can lay directly on the grates and get a nice charred edge. Tasty. Samesies with the corn. I’m a big fan of grilling naked corn directly on the grates for that sweet and smokey outcome. Oil up your veggies, salt ’em, pepper ’em, grill ’em. The zucchini will grill a little faster than the corn, so keep an eye on things. Flip the zucchini once, halfway through, around the 5 minute mark for a total grilling time of about 10 minutes (or so). If you want those oh so pretty hatched grilled marks, rotate the zucchini 90 degrees after the first 2-3 minutes, then flip 2-3 minutes later. Turn the corn a quarter of a turn every 5 minutes, for a total of about 20. Once their grill thing is done, let the zucchini and corn cool a bit, about 5-10 minutes at room temperature, just until they’re cool enough to handle. Slice the corn from the cobs. Slice the zucchini in half again lengthwise, then slice widthwise into chunks. 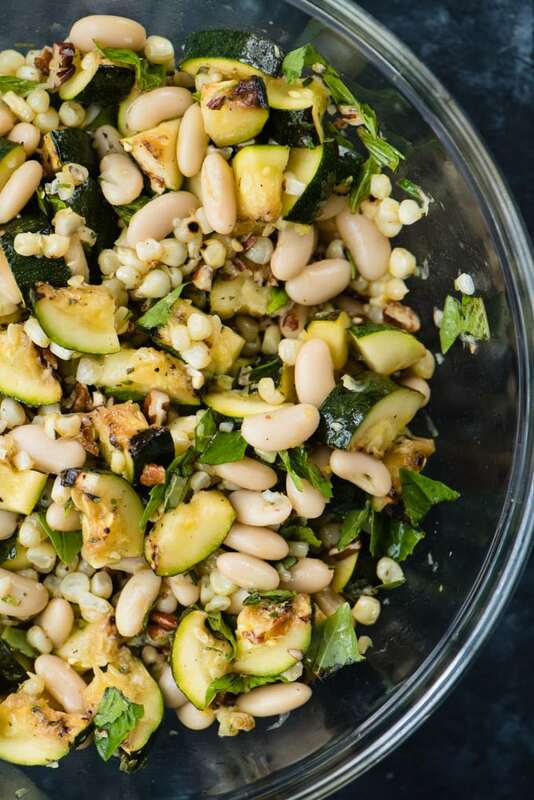 Add the grilled zucchini and corn to the marinated white beans, and then some fresh basil and chopped pecans. Give it all another good toss. The zucchini will soak up the residual vinaigrette. WOAH. Summer in a bowl. So much delicious happening here. Smokey + sweet + bright + tart. This zucchini salad is substantial enough for a meal (I had it for lunch, then lunch again) but light enough for a side dish. Bring it to a potluck and make all the friends. Just before serving, dust it with a little shaved pecorino cheese. The cheese isn’t mandatory but lends a sharp edge that’s a great complement to the smoky grilled vegetables. 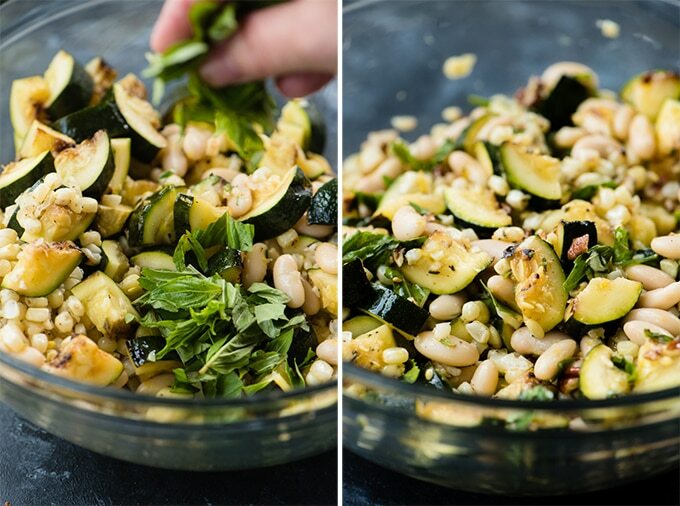 DID YOU MAKE THIS GRILLED ZUCCHINI SALAD? I WANT TO SEE YOUR CREATIONS! SNAP A PICTURE AND SHARE IT HERE ON PINTEREST. 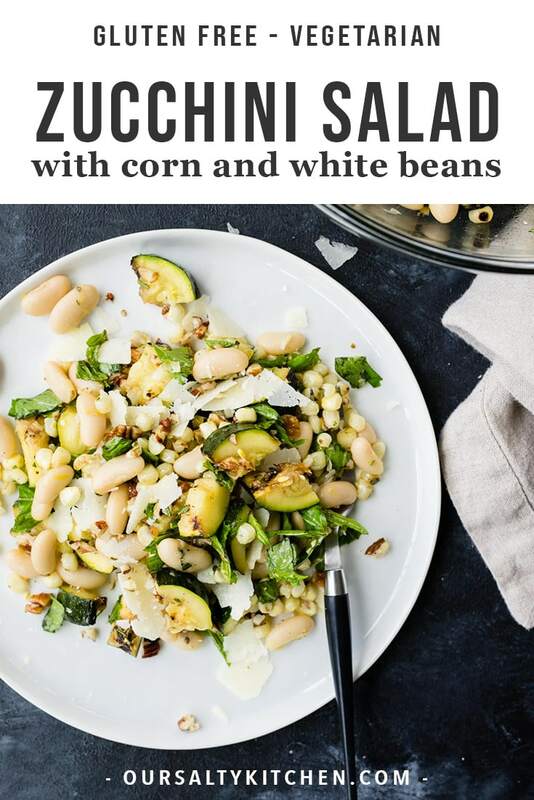 This grilled zucchini salad with corn and marinated white beans is a delicious summer dinner or side dish recipe that's as easy to eat as it is to make. Heat a grill over medium to medium-high heat. If using a charcoal grill, aim for 350-375*. Toss the cannellini beans with the fresh rosemary. Whisk together the extra virgin olive oil, lemon juice, lemon zest, garlic, and honey. Pour the lemon dressing over the beans and toss to combine. 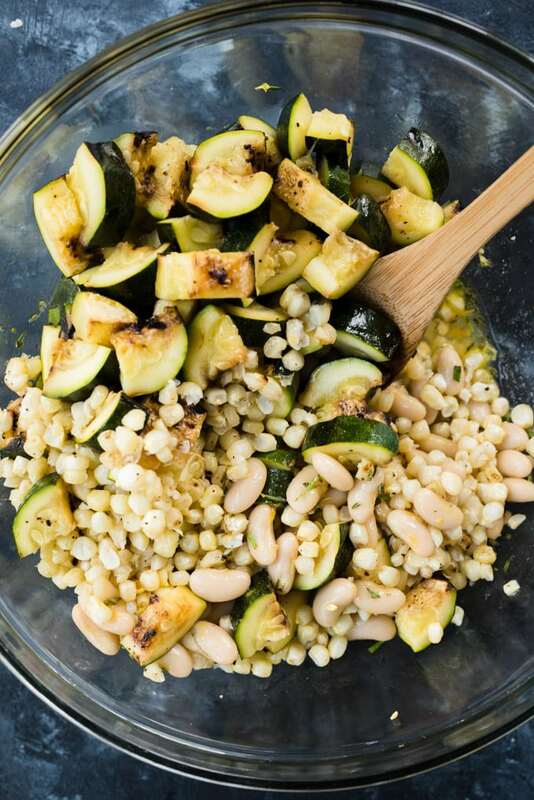 Set aside to marinate at room temperature for up to 30 minutes while you grill the zucchini and corn. Brush the zucchini halves and and corn with olive oil, then sprinkle with salt and pepper. 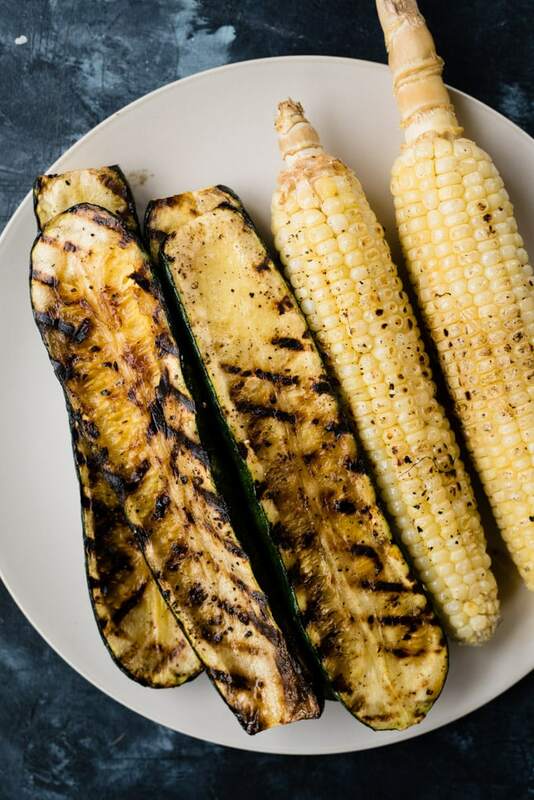 Place the zucchini cut side down on the grill, and place the whole corn cobs directly on the grill. Grill the zucchini 5-6 minutes, or until charred, then flip and grill an additional 5-6 minutes. Grill the corn a total of 18-20 minutes, or until charred on all sides, rotating a quarter of a turn every 4-5 minutes. 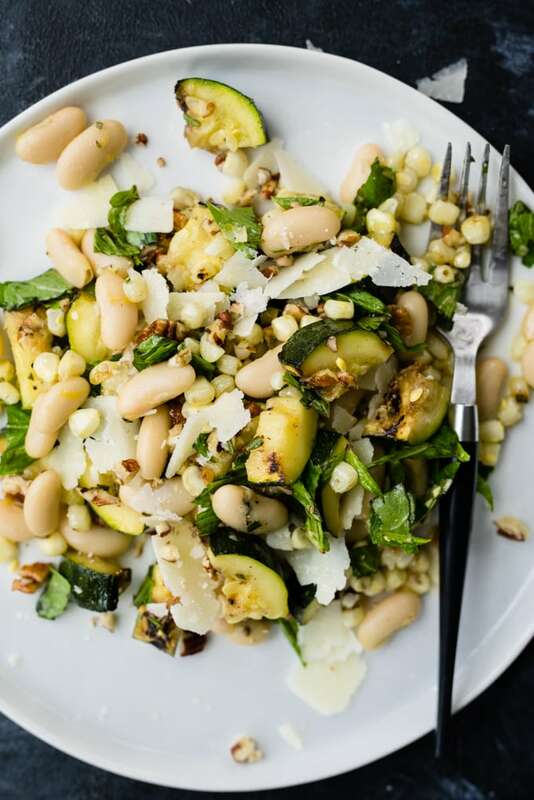 Remove the zucchini and corn from the grill as they finish and set aside on a plate until cool enough to handle. Dice the zucchini, then slice the corn from the cobs. Add the grilled vegetables to the marinated white beans, then add the basil and chopped pecans and toss. To serve as an entree, divide the salad between four plates, then garnish with pecorino cheese to taste. Alternatively, serve as a side dish with pecorino cheese on the side. This salad keeps in the fridge without the cheese garnish for up to three days in a tightly sealed container and can be served cold or room temperature.